Right after participating as a guest speaker at “A Food Biz Workshop” a week ago where I found out that some 80% food business fails within the first two years of operation, I got to attend an event hosted by one that represents the other extreme end – the Martell Pure Gourmet event by the brand that has been in existence since 1715. Yeap, that’s just a year shy of 300, with perhaps one of the oldest single product, the Martell VSOP being in the market since 1831. 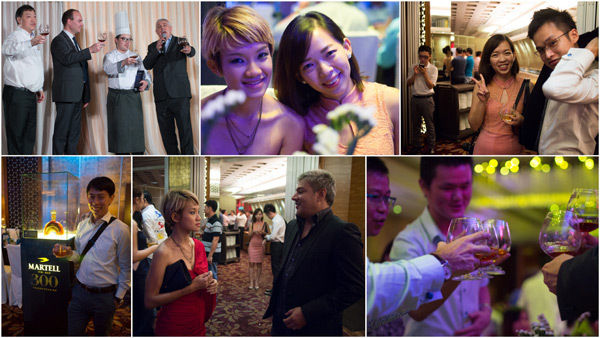 While last year’s dinner was hosted at JW Marriott, Martell chose the Grand Imperial Chinese restaurant at Hartamas Shopping Centre for this year’s annual Pure Gourmet. I was very delighted and honoured to be invited to this year’s dinner again after having had a very good experience last year. 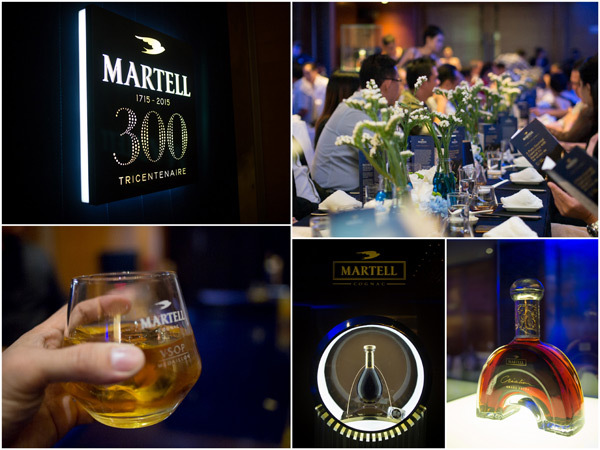 I was surprised that Malaysia actually happened to be the 2nd largest market in the world for Martell after China, and I guess this is partly due to the way we consume cognac, which, fortunately or not, was in full display during the dinner with many happily cheering each other “Happy Birthday to You” while emptying their glasses as the night went on. P/S: It wasn’t anyone’s birthday, but we had a lot of fun. 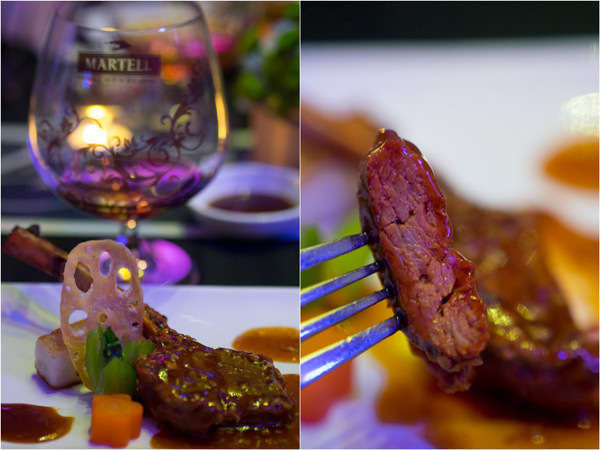 Anyway, pure gourmet is about the blend of exquisite ingredients, skills, and passion in the creation of inspiring dishes, as with how each bottle of Martell cognac is created, so lets get on with the dinner. 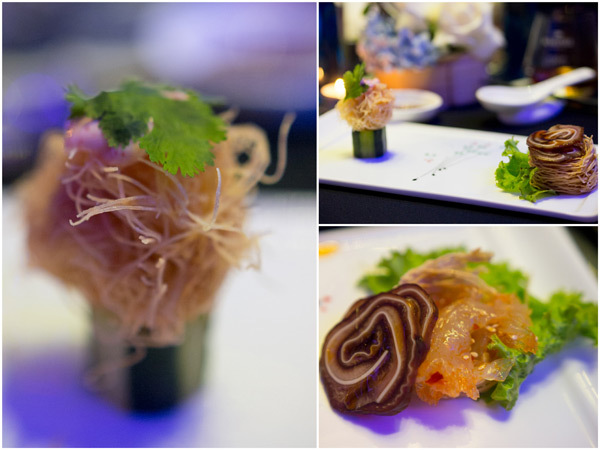 We started out with chilled Sze Chuan jelly fish with thousand layer pig ear accompanied deep fried scallop wrapped with German vermicelli rice noodle. 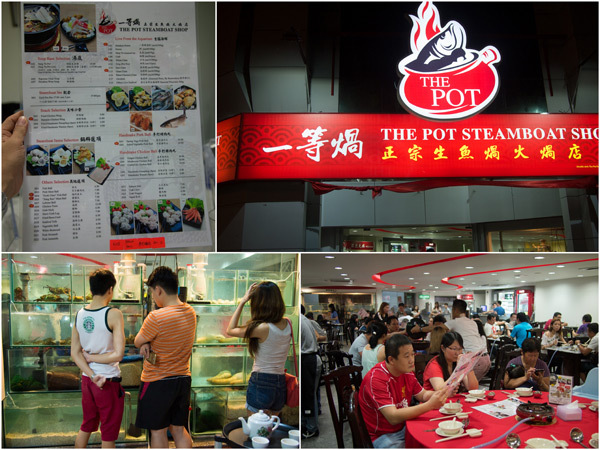 A pretty descriptive dish and one that has several characters all rolled into one. 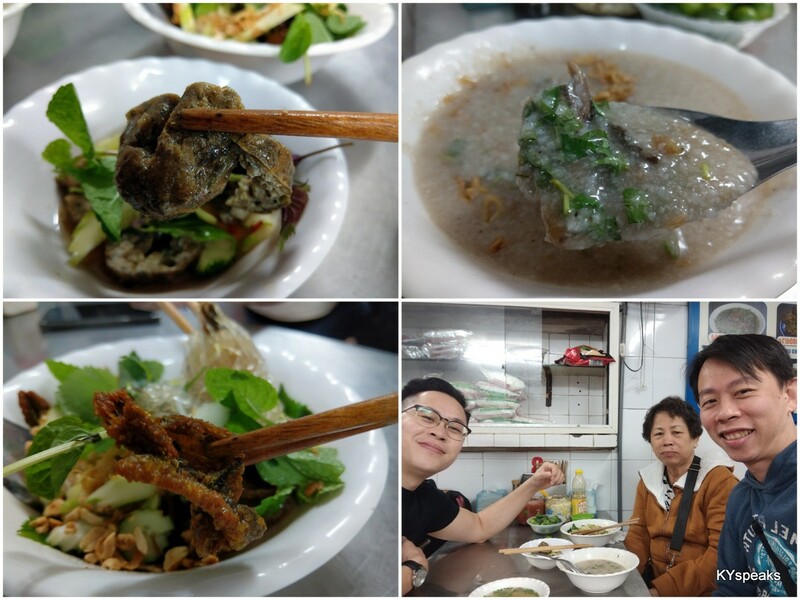 The jelly fish and pigs ear with the softer texture and a more complex taste, and deep fried scallop an explosion of seafood sweetness beneath the the crispy and rawer tasting vermicelli. This was paired with Martell V.S.O.P. Next up was a relatively unpretentious baked water king prawn with cheese to go with the very recognizable Martell Cordon Bleu, perhaps the gold standard of cognac. 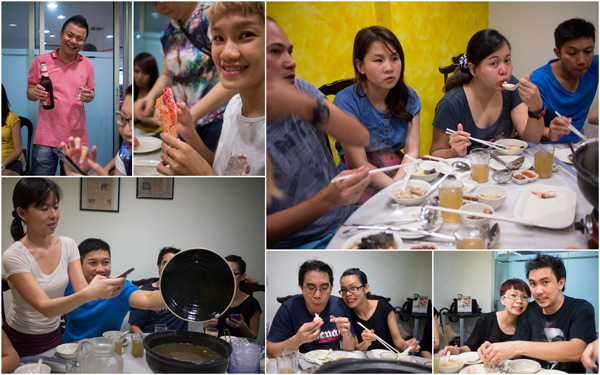 The execution of the prawn was on the dot, I really dug into the head and savour the juices out of this. Though this is probably the only dish I could come close to replicating at home, it was also one of my favorites. Third dish of the night was deep fried air flown Japanese Ayor fish with lemon (also known as Ayu fish). Found in the rivers and lakes around Hokkaido, this fresh water fish is famous for the sweetness of its flesh, which was brought out to its fullest potential when paired with Martell Cordon Bleu. 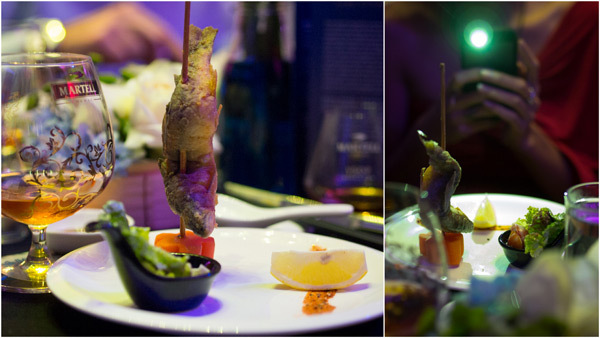 Following the fish, we had the pan fried lamb cutlet with Chef’s special sauce to go with Martell XO. 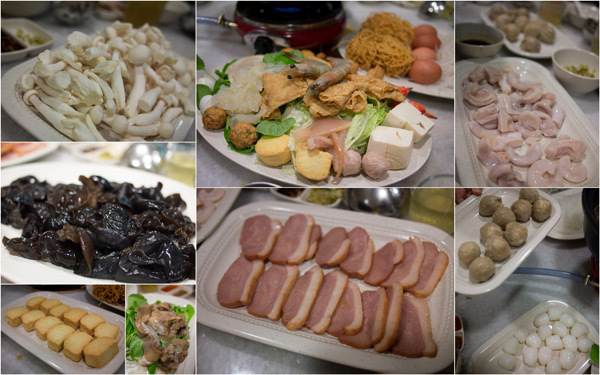 Perhaps I was more accustomed to Western style of lamb cutlet preparation, it took a while to appreciate the more traditional Chinese preparation method of the red meat that is inherently more cooked. In this instance, the sauce takes center stage with the meat playing supporting role. 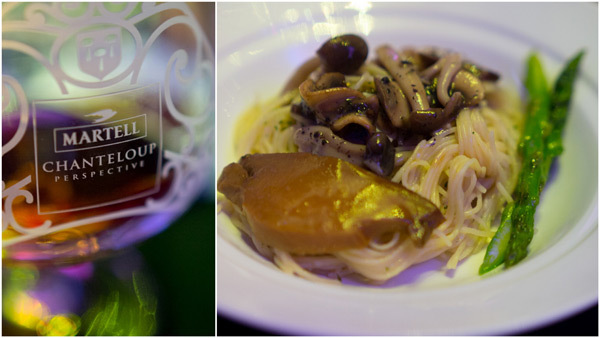 Last dish before dessert was the braised spaghetti with sliced abalone, black truffle and mushroom. The hint of black truffle went well with abalone, and the fine angel hair spaghetti was the right choice to soak up the flavour. 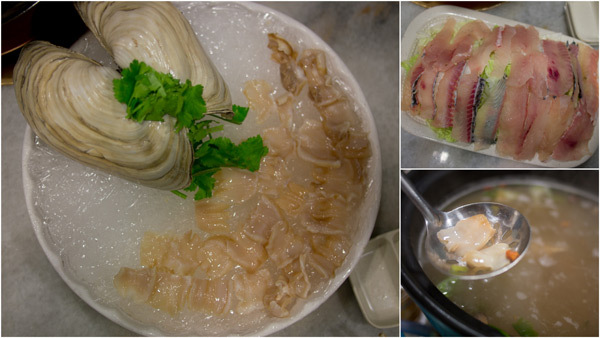 We just wished that it was a whole abalone instead (who doesn’t?). 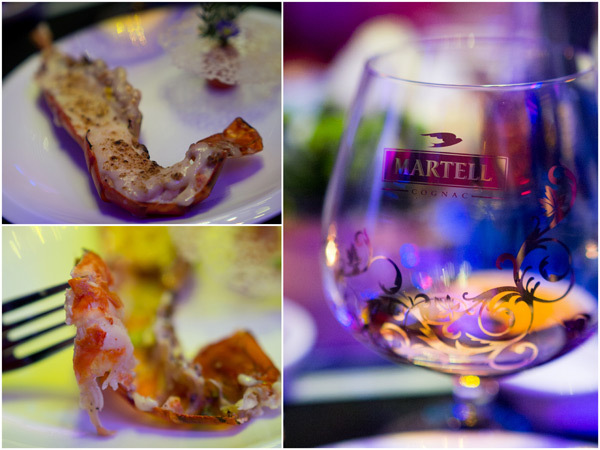 The aroma and elegance of Martell Chanteloup Perspective complimented the dish perfectly. Finally, we end the dinner with a host of three desserts prepared by Grand Imperial and had the pleasure to pair them with Martell Creation Grand Extra, the silky smooth and yet very powerful tasting cognac. 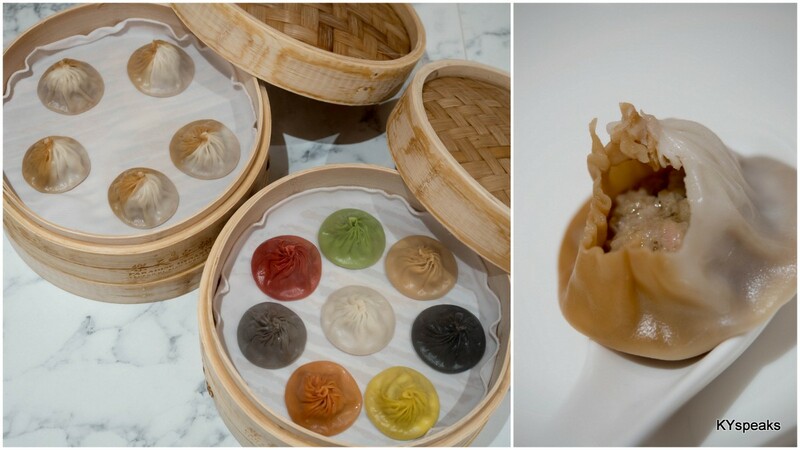 A unique taste to end a pretty unique and special dinner. A big thank you to Siew Kheng for the invitation, and hopefully we’ll have the privilege to be a part of this again next year! 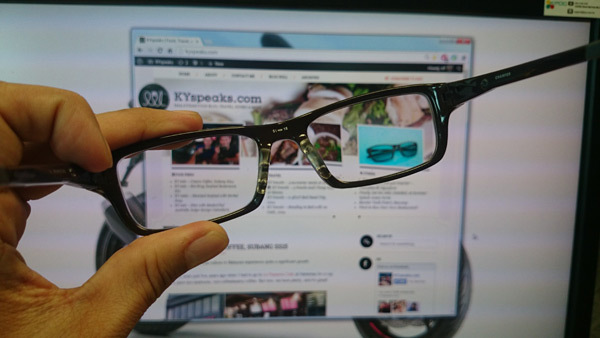 Having had my new Transitions Signature lens glasses for a couple months now, I really began to appreciate the new technology more that went into these prescription glasses more and more, and I am happy that it works as well as they claimed to be. Considering that the previous version I used was already very good, the improvement is still very noticeable. I want to take you through the lenses and talk a little bit on how they work. For those who aren’t familiar with Transitions, my previous article Smart Lenses Just got Smarter – Transition® Signature talked a little about how they work in a more general and some of the benefits brought by these glasses. In this post, I want to dwell into them a little bit more with real life examples from my own. The most important technology behind Transitions Signature lenses is Chromea7. This is a patented formulation consisting unique dyes that are integrated to the surface of every Transitions Signature lens. The dyes are made up of trillions of molecules that smoothly re calibrate as the light condition changes. From dark to light and back at just the right tint so that the optimal amount of light reaches your eyes. Yes, this is the twenty first century, we have stuff like these! 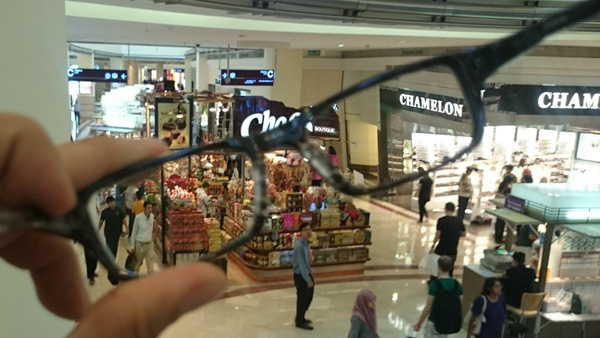 So, when you are indoor away from sunlight, such as the example above in KLCC Suria Mall, the glasses are completely clear and act like any non-tinted prescription glasses. Conveniently, this also works when you’re in front of the computer even though technically there are lights shining at you, but because the activation of the tint is by UV lights, it does not get tinted when you’re working. This of course, applies only for working indoor. Chromea7 technology was designed to be more reactive to indirect light. Which means that light that bounces off building, cars, and other surfaces is also sensed by the lenses and react accordingly. 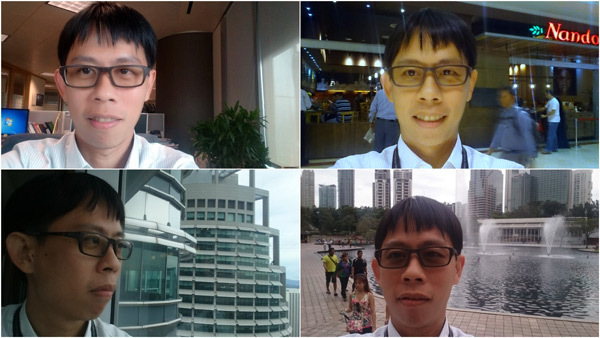 This property is especially important if you find yourself in cityscape such as KL where you might not be in direct sunlight among the tall buildings, cars, buses and so forth, where reflections that results in indirect sunlight are prevalent. In the example above by the window in a cloudy day, you can see that the lens has a slight tint. This is not very pronounced as some of the UV light is blocked off by the window, but at the same time it shows the re-activeness of Transitions lenses away from direct sunlight. Photocrhomic lenses, as with most technology that relates to chemical or physical reactions, usually gets influenced by temperature. While traditional photochromic lenses don’t get as dark in hotter climate because of the way heat interacts with the molecules, Chromea7 technology was formulated to be more independent of temperature and be able to get darker even in hotter climates. 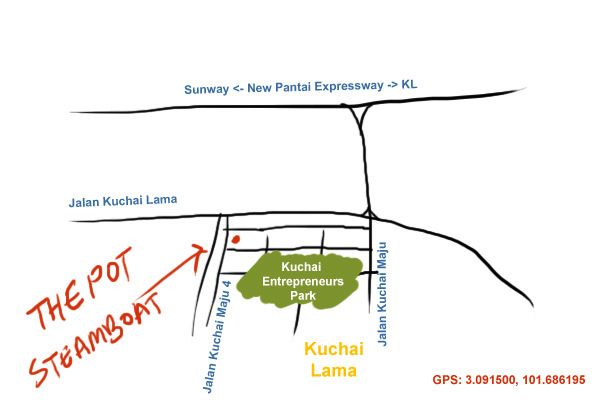 This property bode very well with our Malaysian climate. As the example above shows. 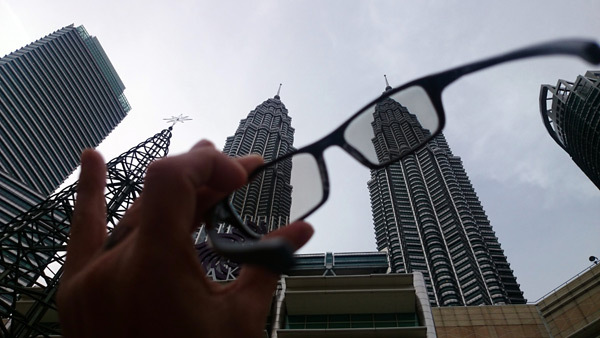 Being outdoor at KLCC park in a pretty warm late afternoon, the glasses changed almost instantaneously to a comfortable tint. Looking up to this beautiful building doesn’t come with the associated squinting or having to cover part of your forehead with your palm as a makeshift “roof” anymore. With the experience gathered by Transitions over the years, they were able to formulate the dye in such a way that the lens provide an even color at all levels of tint, giving the right shade and the right color every time. This is a slightly harder property to show in pictures, but for the past couple months owning this pair of glasses. I must say that I’m very satisfied with the way it works. It gives great clarity and the tint, while not as dark as sunglasses, provides very sufficient protection against both direct and indirect sunlight and glare when I’m outdoor. 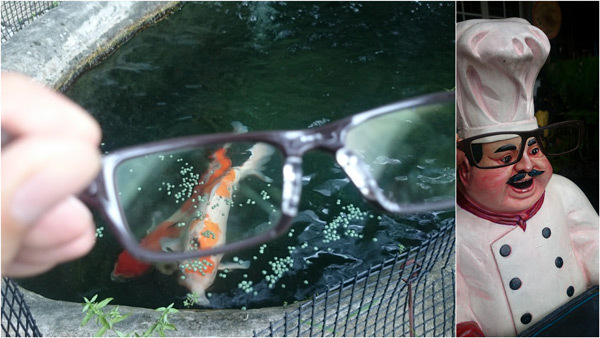 Moving the glasses to my little chef that’s by the same pond but at a brighter area, you can see that the colour of the lens switched to a slightly darker tint. This showcases the “right shade, right colour” property of the lens. 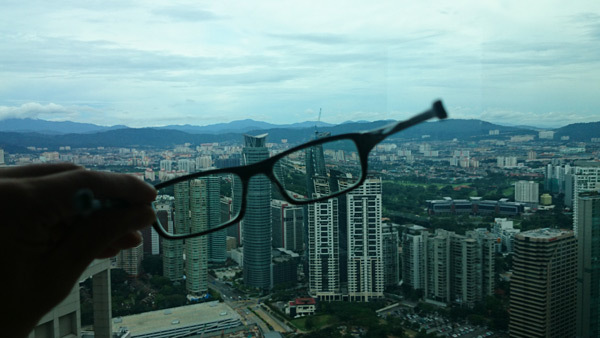 Transitions Signature lens can be paired with a wide variety of frames, head to http://www.transitions.com/en-my/where-to-buy/ to find out where you can get them. When I was a student in the States years ago, I remember one of the things we always struggle to find when it comes to cooking ingredients is santan, or coconut milk. 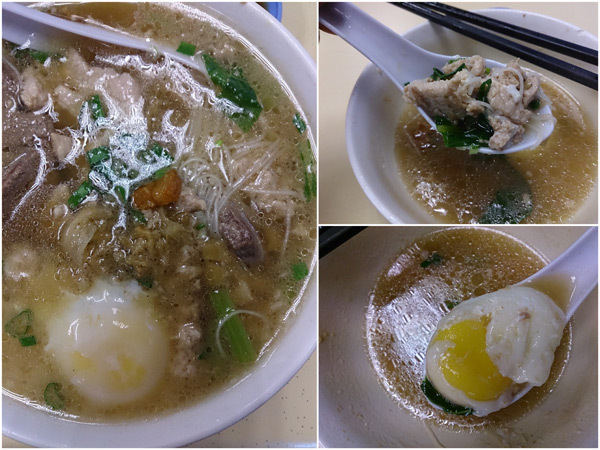 I mean, if you’re a Malaysian, you got to have curry, and to make curry and a host of other Malaysian dishes, santan is often a key ingredients. Back in the days, we had to substitute santan with milk, so you can imagine how happy I would have been if I had access to something like S&P Santan instant coconut cream powder back then. 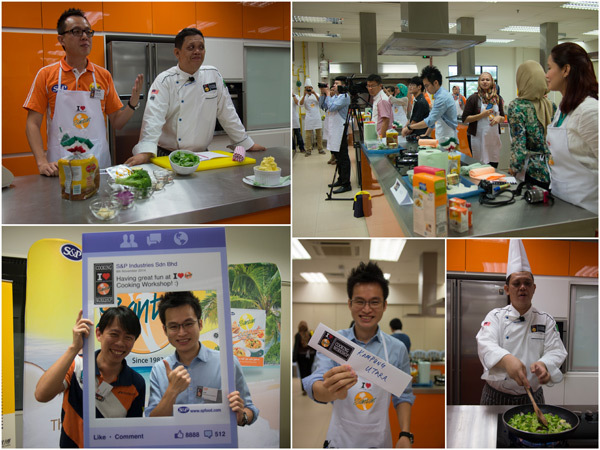 A couple weeks ago, I was invited to attend the I love S&P Santan Cooking Workshop with Chef Andri to check out some of the products from S&P Industries as well as getting our hands wet at the kitchen learning from the good chef in making three different dishes. 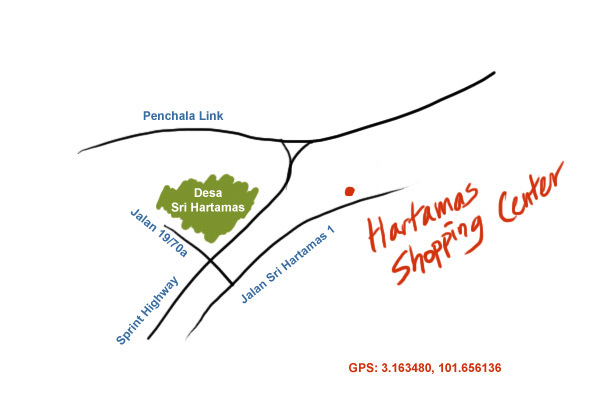 A little bit on S&P Industries Sdn Bhd. S&P Industries is the pioneer in coconut milk powder manufacturing in Malaysia since 1983 and is the world’s largest producer of coconut milk powder with distributions to more than 40 countries. Their Santan Instant Coconut Milk Powder is made 100% from fresh coconut, does not have preservative or artificial coloring. The coconut milk powder comes in 50 gram sachets in original, omega, & pandan. They also have coconut milk coming in 200 ml and 1 liter packs. 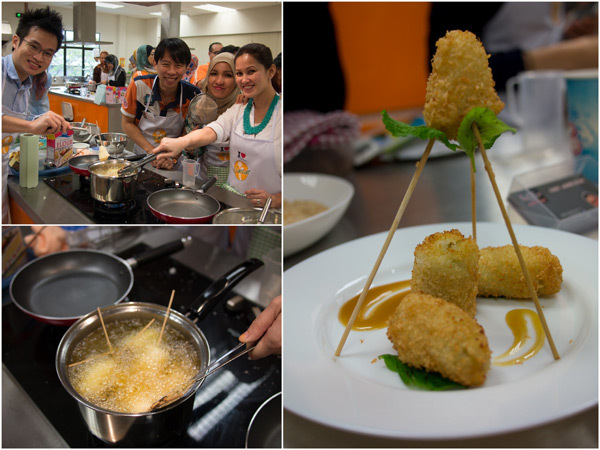 We had a lot of fun at FFM Marketing’s kitchen with the lively Chef Andri showing off his three recipes – an appetizer, a main dish, and a dessert. I really liked how versatile the coconut cream powder was, it is very easy and convenient to use compared to traditional method. Simply add in the powder while cooking and let it dissolve. The S&P Sejati Desiccated Coconut also came in very handy for making desserts and other dishes, the longer shell life is most helpful too. 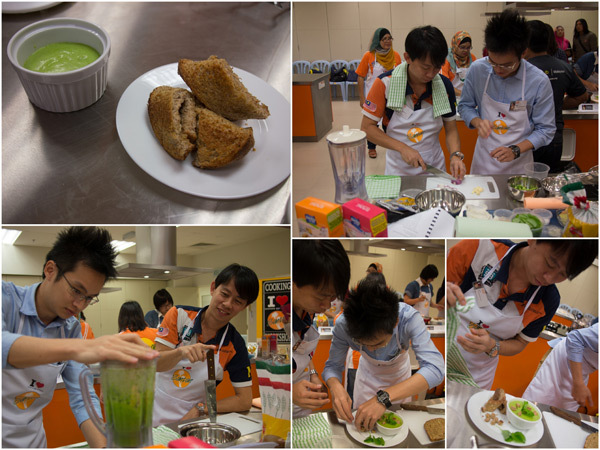 With Lex from KampungBoyCityGal as my partner (we called our team Kampung Utara), we competed with other teams in creating these dishes, and although we did not win, I think we can claim that we made some of the best looking dishes among the contestants. If you aren’t the best, try to look the best, right? 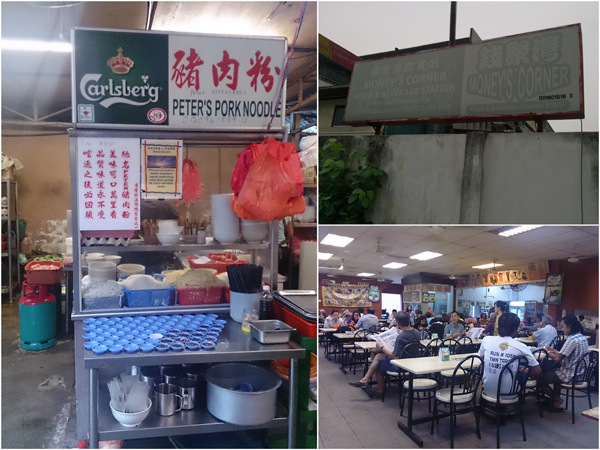 I also like the choice of venue, the FFM cooking facility located at Sungai Buloh is really well equipped. In fact we were the first group of people to get to use it. 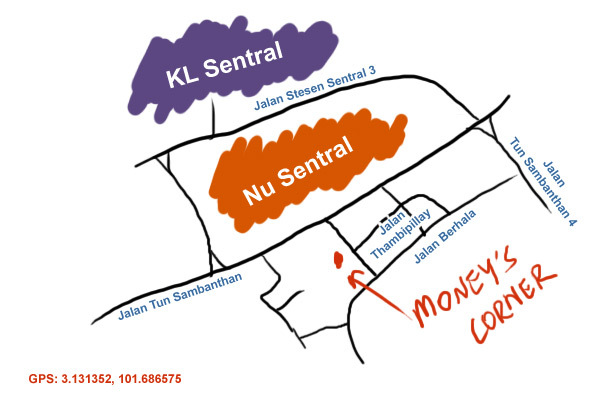 The venue is open to rental too, do contact marketing@ffmb.com.my or 03-61457888 for inquiries. 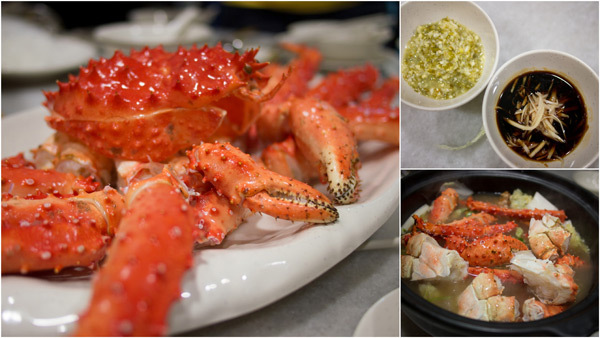 The recipes from Chef Andri are shared below so you can give them a try at home. Rinse fresh baby spinach leaves, shaking off excess water. Melt butter in large sauce pan t medium heat. Add onion and garlic, saute for 3 mins of until tender. Add vegetable stock, let boil and add broccoli. Put heat at low temperature and simmer for 3 mins or until broccoli is tender. Add fresh baby spinach and cook till just soft. Let cool for a while. Using a food processor, process soup until smooth. Return soup to sauce pan and place over medium heat. Add S&P Santan Instant Coconut Cream Powder, nutmeg powder, and white pepper. Bring to gentle simmer. 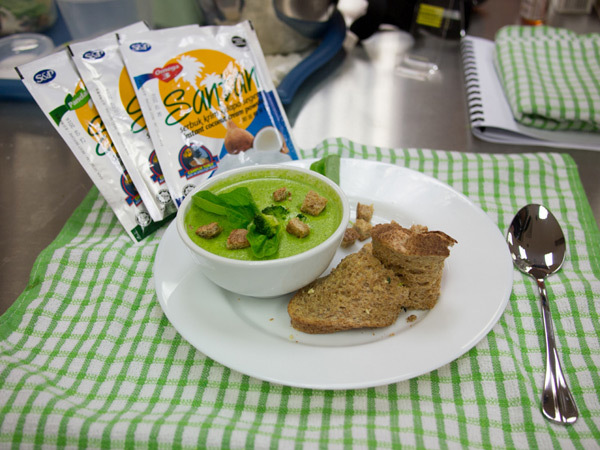 Ladle into cups and served with Massimo Wheat Germ garlic bread. Meanwhile, preheat sauce pan with low to medium heat and put in butter. Let it melt and add Blue Key Superfine Flour. Mix well with a balloon whisk until smooth. Add in vegetable stock, whisk well and add in S&P Pandan Santan Coconut Cream Powder, whisk until warm but not boiled. Add in nutmeg powder, grated cheddar cheese and grated parmesan cheese, stir well until thicken. Turn off heat and put aside. 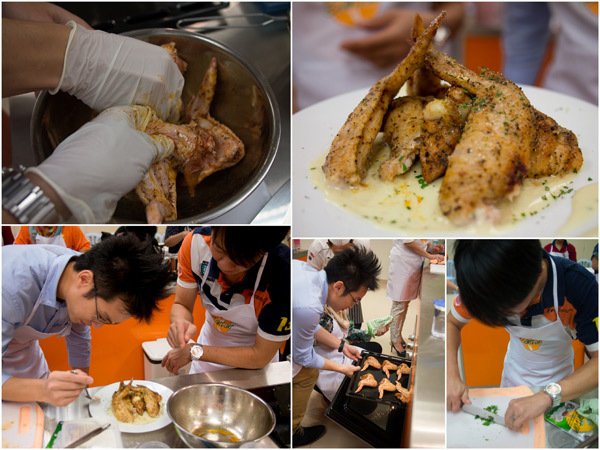 Preheat oven to 170C and preheat frying pan with medium heat and seaf the marinated wings until golden brown. Put seared wings on oven tray and bake for 15 mins. 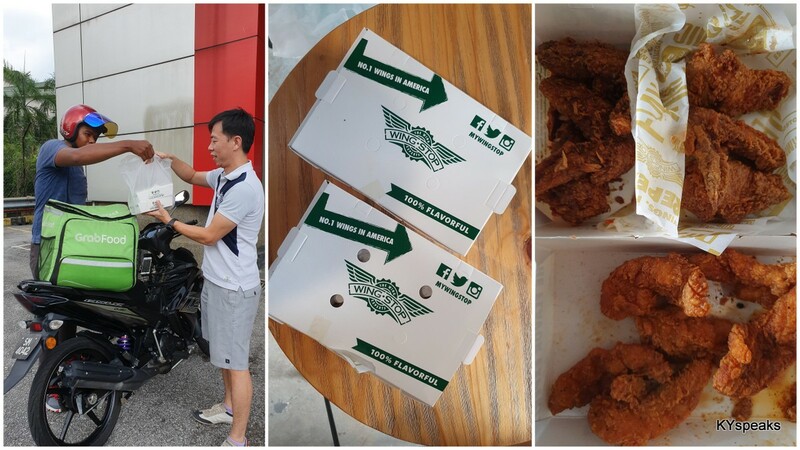 Spread coconut pandan cheese sauce on plate and arrange the baked wings, sprinkle grated parmesan cheese on top. Preheat sauce pan at medium heat to make caramel sauce, stir the sugar, cream and butter, stir well for 4-5 minutes for until smooth. Then drop Star Brand Artificial Banana Flavour and stir well. Sift the Blue Key Self Raising Flour and bicarbonate of soda into a bowl. Whisk in soda water until smooth. Spread S&P Santan Sejati Desiccated Coconut and Blue Key Superfine Flour over separate plates. Preheat saucepan at medium heat with Seri Murni Cooking Oil. Roll 3 pieces of banana in flour and shake off excess. use bamboo stick and dip in batter, then roll in desiccated coconut to coat. Carefully add to the oil. Cook for 1-2 minutes or until golden. Transfer to a plate lined with paper towel. Spread the caramel sauce over a serving plate and arrange the fried bananas, put vanilla ice cream at side and garnish with fresh mint leaves and sprinkle toasted desiccated coconut. 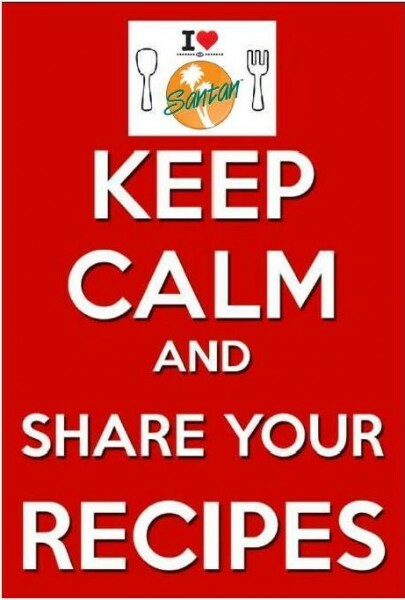 Do you love cooking and have some awesome recipes to share? You might even get to win cool prizes! 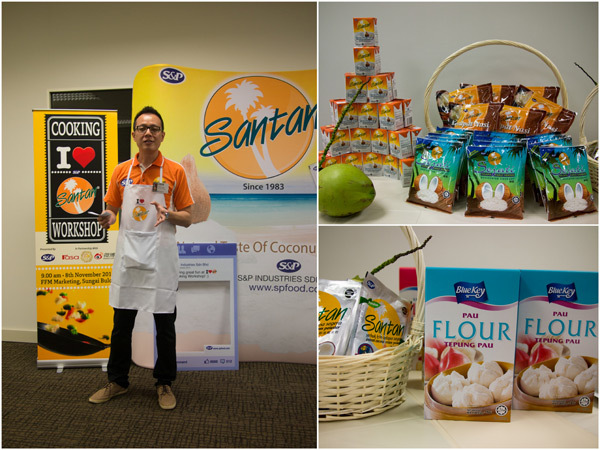 Just share your very own recipes using S&P Santan products and stand a chance to win attractive prizes. Head on to S&P Santan Facebook Page to find out more.